Today, I'm featuring a guest post by fellow expat blogger Amelia of Chai a Cup of Life. She recently moved to Dubai, and it's always interesting to look at your city from a newcomer's perspective, so I invited her to write about it. On Amelia's blog, you'll find lots to read about life as expat, tips for healthy living, and some nice recipes too! Before even visiting Dubai, I felt like I’d already been there. I’d seen so many images, heard many stories and positive things, that I was almost scared that it may not live up to what I assumed it to be like. However, after coming to Dubai for the first time, I can now definitely say that it lives up to the hype. Dubai is completely different to any country I have been to, yet there is a little bit of home here. And unless you don’t like the sun and warm weather, I feel that anyone can love it here, whether it is for a holiday or to live. 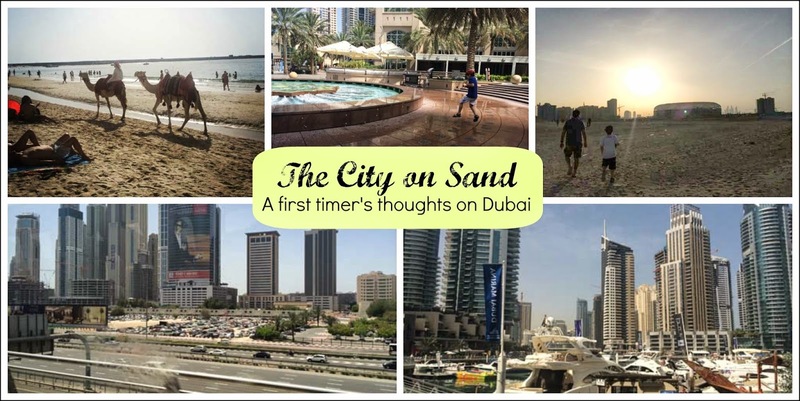 So as a first timer, here are my thoughts and impressions on Dubai: the city on sand. A city where anything is possible. “Buildings. Lots and lots of tall buildings”, my son would say when explaining Dubai. It is quite surreal to believe how a city can survive in a desert. With so many skyscrapers, it was intriguing to know how on earth could sand hold up so much weight without toppling over! A few days before taking the flight to Dubai, I watched an amazing documentary which explains the ingenious technology that allowed engineers to build a city in the desert. Anything seems possible here: with the highest building in the world, to the largest fireworks display on Guinness Records, Dubai sometimes seems like a mirage, but is in fact, the real thing. Coming directly from India, where you pretty much only see a handful of expats, it was nice to see a huge mix of cultures. I love walking down some of the busy parts of Dubai and seeing so many cultures in one place. One of my favourite pastimes is watching and listening to groups of people and listening to the language they speak, trying to work out where they are from. People live in Dubai from all over the world as there is a large expat community here. I don’t think I would find a bigger mix of culture in one city than in Dubai. As an Australian living as an expat in India, I would sometimes have difficulty in finding foods in New Delhi that I craved for and had to take an extra effort in finding them. Grocery shopping in Dubai is a lot of fun because you find everything! As most products are imported, you can buy Swiss chocolate from Switzerland, Australian vegemite, papayas from India to salt from Holland. In larger grocery stores, sometimes there is so much variety it can be overwhelming. I remember when my husband first visited Dubai for a work trip he pointed out that it was not a place for kids to grow up in. Initially, this may be something that appears so, but Dubai has so much to offer for kids. From well equipped parks and water side fun activities, to inside games when it is too hot to play outside. Getting lost and taking the wrong turn in Dubai is inevitable. It actually looks pretty simple to drive here as most traffic ends up on the main road, Sheikh Zayed Road. Unless you are a direction expert or have an internal map, you will surely get lost on the roads! Dubai roads and rules are much like it is in Australia except with less U- turns. Be careful as people drive fast! Dubai is a great city. It has the excitement of a cosmopolitan city and also the peace and quietness I need. It still gives me a shock when I see the huge contrast of city life to complete desert. Dubai is still a growing city and excited to see what else is in store! Thank you so much Tarana for letting me contribute to your wonderful blog! Have you been to Dubai? Amelia believes living a happy and balanced life. On a normal day you would see her either playing with her 6 year old son, experimenting with a new cooking recipe, practising yoga or putting on really bright nail polish! She loves writing on her blog Chai a Cup of Life about living, growing and learning. You can also catch her on Pinterest, Facebook and Google Plus. Everyone we know who's moved to Dubai with kids has loved it. Must, must visit some day. I highly recommend it, Kriss! Tarana, thanks so much for featuring mt post on Dubai! i have been wanting to visit Dubai for a really long time - im just fascinated by it. thanks Tarana and Amelia for sharing such a great article..I am also moving to Dubai after few months..I am so worried..I am relief to some extent..the things that keep worrying me is about the warm weather..Ca we really tolerate it ? It's an amazing place, Dixya! I was also worried about the heat before moving here as I did not handle it well in Delhi! However, all indoor places have A/C - and no power cuts! I have not experienced the heat of summer yet, but there are so many things to do indoor that you should be comfortable. You must come by Dixya - let me know if you do! It would be interesting to see the changes! Imagine my delight to see two of my favorite bloggers come together! Welcome to Dubai Amelia! There is a curve of emotions when you first come to Dubai. First amazement as you are stuck by the splendor. Then you go through a phase where the splendor feels like the norm and you earn to go back to familiar places. Then comes the settling in feeling.. where you are comfortable, happy and exploring the nooks and corners of this country and wouldn't be anywhere else in the world.. And the kids will love it here, rest assured! Wish you all the emotions that come with Dubai and UAE, Amelia. Thank you for your kind words! The way you described the settling in into Dubai is accurate. It's easy to get complacent after a point, but there's always something new to do here. My son is really fascinated with Dubai, especially with photos of the world's tallest building. I'd love to take him exploring there one day. Great post! The Burj Khalifa is amazing, and Dubai has so much for kids. You should plan a trip! Great place! Thanks for the post! Hope to visit there one day!